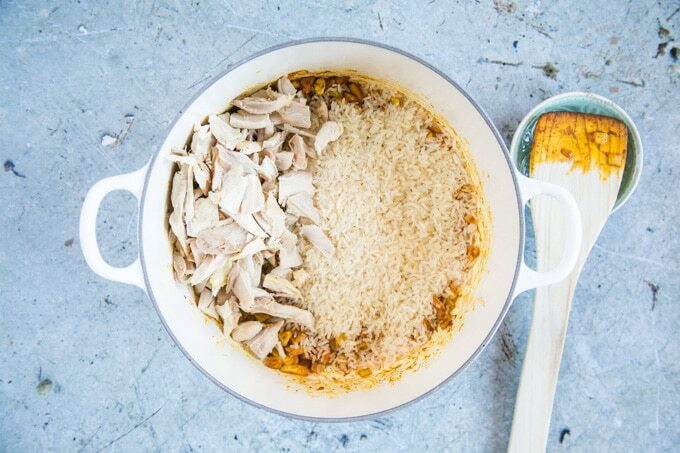 This easy chicken biryani is a quick & easy one pot ideal for mid week meals. Perfect for using up leftover roast chicken. Ready in 40 minutes. Freezes well. Gluten and diary free. Recipe includes instructions for Instant Pot or Electric Pressure Cooker and detailed notes on ingredient substitutions and additions as well as WeightWatchers Points. 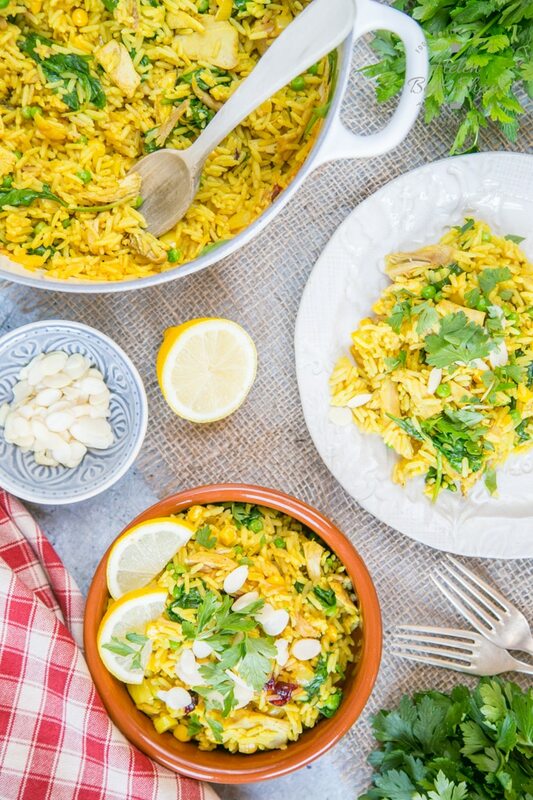 Can I Freeze Leftover Roast Chicken Biryani? 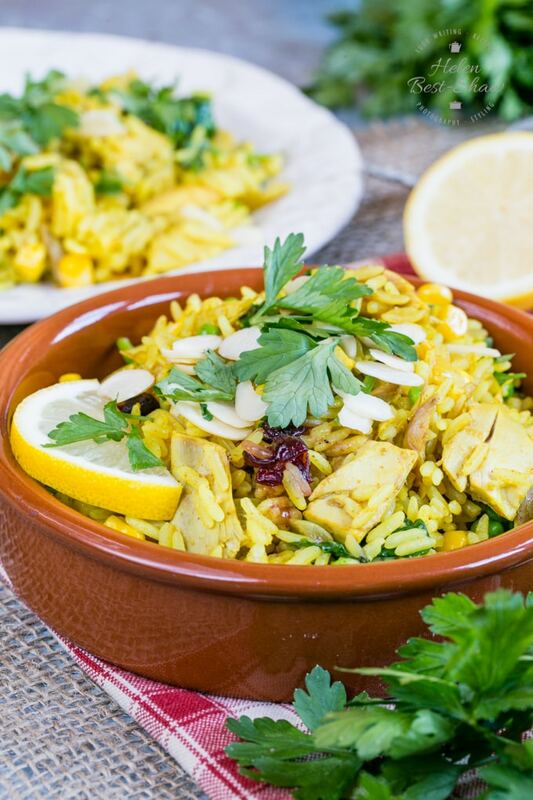 With this easy chicken biryani you can have dinner on the table in 40 minutes with only 10 minutes hands on time! I usually make double and freeze the leftovers for another meal, or take to work as a packed lunch the next day. I’m always keen to make the most of leftovers, and the humble Sunday roast means lovely leftovers. Even though I usually cook for just the two of us I always buy a large 2kg+ chicken, as I thinks that they taste better, and I love the leftovers. Similarly I always roast lots of extra vegetables and use them later in the week in soups, broths and frittatas. 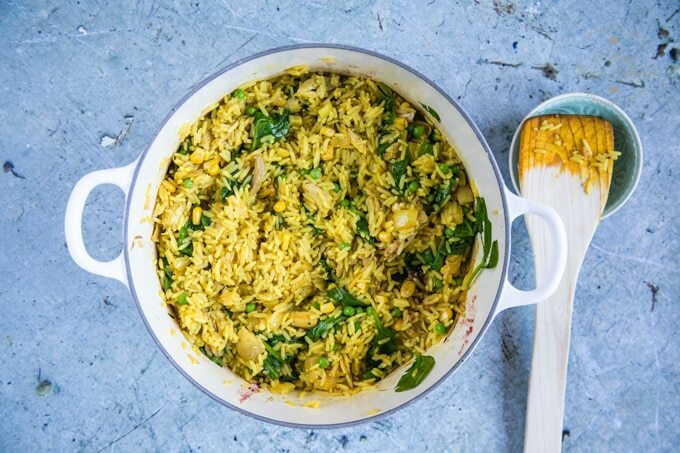 This recipe for leftover roast chicken biryani is simple, tasty and adaptable: just adjust the spicing to your preference. A traditional biryrani will have layers of rice and meat, this dish mixes everything together, and of course isn’t in any way authentic, but is no less delicious. You can make your own stock, or use good quality ready made, pot or cube. 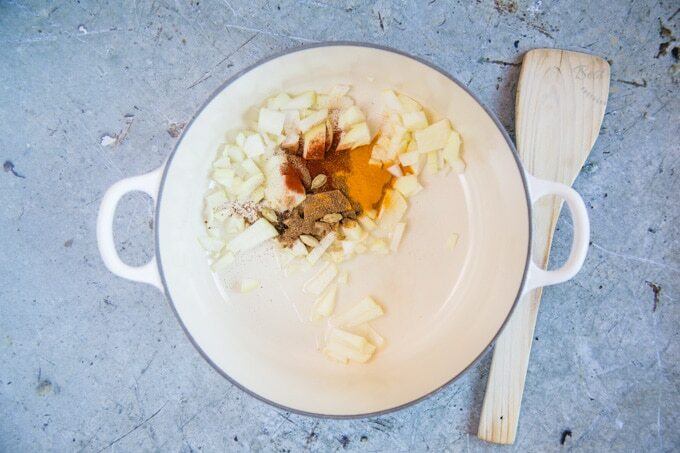 If you make your own stock (easy, thrifty and highly recommended), then you can make the stock using the chicken carcass, to really eke out every morsel of flavour from the bird. Once I’ve stripped my carcass I freeze it until I have a few then make a big batch of stock. 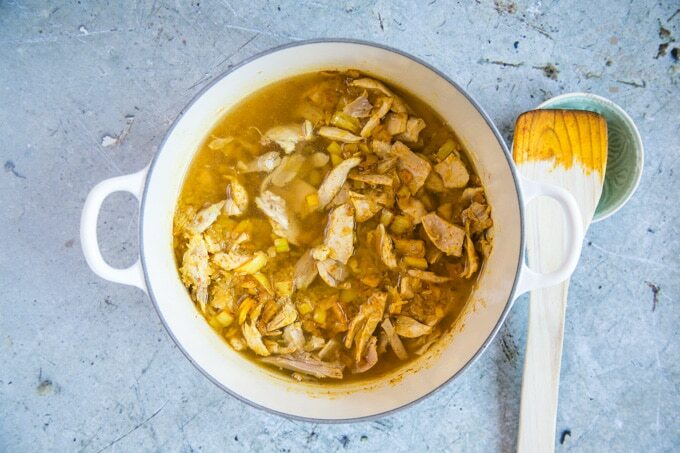 If you don’t have leftover chicken, then cut up skinless breasts or boned thighs into bite sized pieces and add them at this stage. 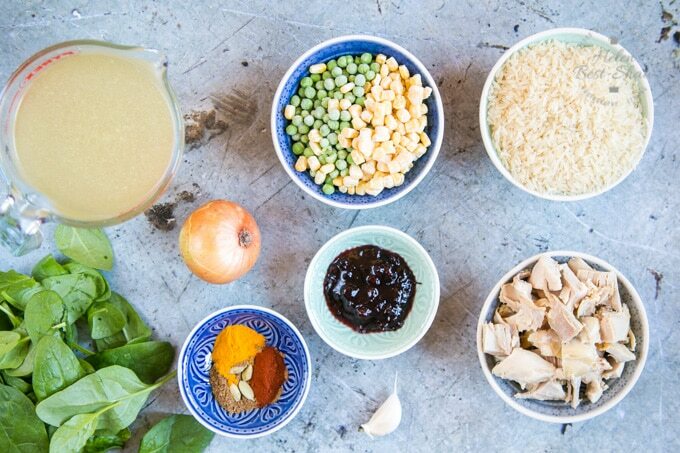 Step 4 – Add the rice and leftover roast chicken, and mix well to coat the rice and turkey in the spice mixture. 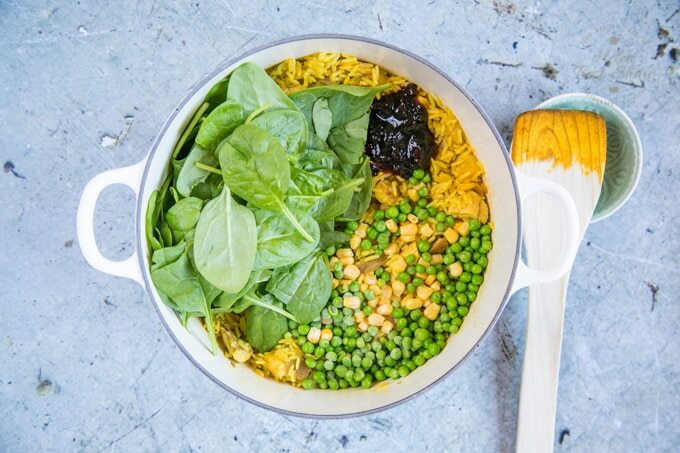 Step 6 – Drain the peas and corn and add to the pot along with the spinach and mango chutney, stir well and return to the oven to cook for a further 5 minutes. This is a very easy and forgiving dish providing you get the rice to liquid ratio right. No Mango Chutney? 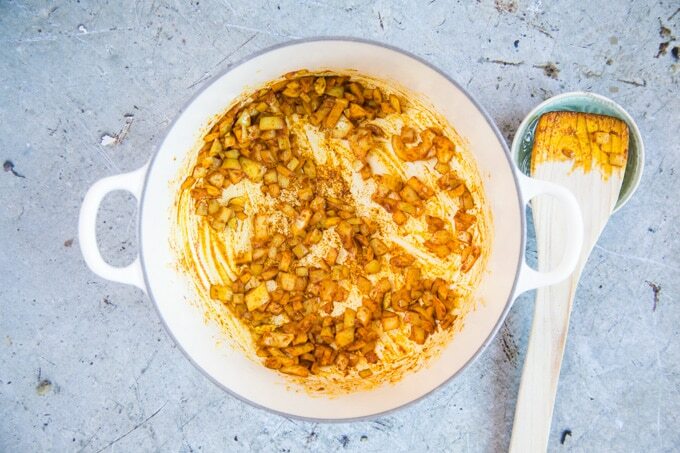 Add a good dollop of any other chutney, even a spoon of apricot jam would be delicious. 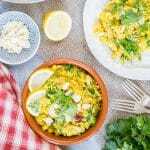 Try my leftover roast chicken frittata or my healthy Coronation chicken. If you try this Easy Leftover Roast Chicken Biryani please tag #FussFreeFlavours on Instagram or Twitter. It is amazing for me when for me when you make one of my recipes and I really do love to see them. You can also share it on my Facebook page. Please pin this recipe to Pinterest too! Thanks for reading Fuss Free Flavours!